A full list of available capabilities for WBE WURFL.js Business Edition can be found here. WURFL.js Business Edition allows clients to cache the WURFL response on the end-user's browser in order to increase overall performance. When testing, it is possible to disable caching by adding debug=true to the query string. Hostnames are required to associate traffic with your account. Under the Associated Hostnames section of your account, you must enter the domains and sub-domains from which you will be accessing WURFL.js Business Edition. By default. WURFL.js Business Edition supports 3 hostnames. You can name the WURFL.js Business Edition service as your own by configuring your Domain Name Server (DNS) using CNAME records. Once these CNAME records are entered in the "Associated CNAME Records" section of your account. WURFL.js Business Edition will honor them. 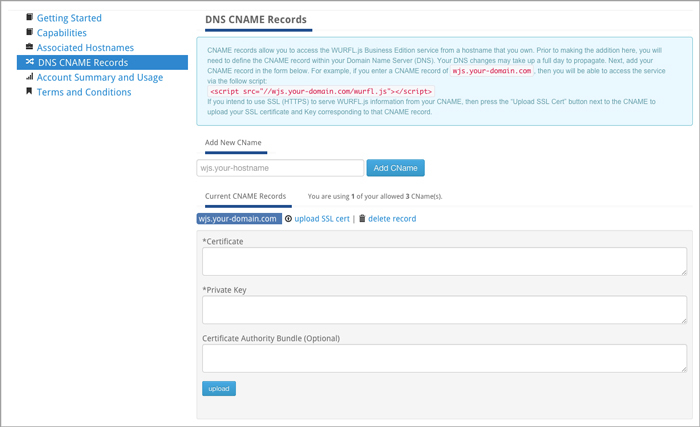 To set up an associated CNAME record, you must configure a CNAME record that points to wjs.wurflcloud.com with your DNS provider, which may or may not be the same as your web hosting provider. You can then enter them in the CNAME section from the left navigation menu of your account. Note: Your DNS changes may take up to a full day to propagate. HTTPS provides a level of security and trust for users of many commercial services. WURFL.js Business Edition enables customers to upload their SSL certificates through their customer vault. Using these certificates, WURFL.js Business Edition can serve multiple hostnames via the CNAME records using HTTPS. WURFL.js Business Edition provides fully dedicated infrastructure for its customers. WURFL.js Business Edition provides a Service Level Agreement with a 99.99% uptime target. The definition of the SLA can be found in the license agreement here. The complete WURFL.js Business Edition License can be found here.